This broccoli and cheese frittata is a wholesome and tasty dish to diversify your diet and weekday menu. You can have it as a lunch or brunch dish or prepare it on a special occasion. 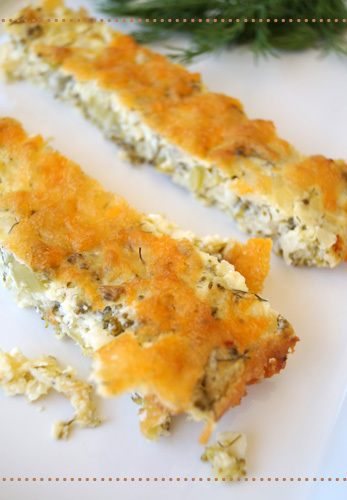 Frittata is a delightful Italian-style dish packed with healthy ingredients. A blend of butter, cheese, and veggies, this dish is great to dress up your lunch or supper table. You can use various ingredients and even leftovers to make frittata and give them a new spin. The colors, textures, and flavors of the ingredients make this dish an art piece. Preheat oil in a frying pan and cook the onion for 3 - 4 minutes. Add the broccoli and cook for 4 - 5 minutes. Leave to cool. Combine the eggs with cottage cheese, season with salt and pepper, and mix well. Spread cooking oil evenly in a baking dish and combine the cooked broccoli with the egg and cheese mix. Bake for about 20-30 minutes. Garnish with grated cheddar. Serve with salad.